Refinancing your mortgage isn’t something that is hard to do. And why people refinance really comes down to “why” they want to. That’s it. I’ll do my best to explain the reasons why people refinance their mortgage and some stories I heard from when I was a mortgage banker. Lower Interest Rate – This ones easy. 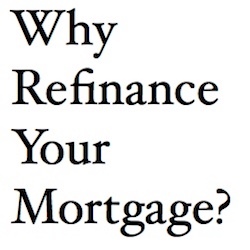 Of course you should refinance your mortgage if you can save some money on your payment. In most cases if you can save .5% or more than it makes sense to do so as long as you are comparing the same mortgage (30 year to 30 year). Lower Payment – Some people may have been in a 15 year mortgage and can no longer make the payments. What they need is to free up cash flow. So they refinance into a 30 year mortgage and see their payment drop in half even with a higher interest rate. Out Of An ARM To A Fixed – There is something about knowing your monthly payment will never change. Some people liked the thought of having an adjustable rate mortgage in the beginning but like the security of a fixed rate mortgage. Take Cash Out – Consolidating credit card debt. Home improvements. Dream vacations. College education. Collections. Liens. Property taxes. Income taxes. Buying a rental property. Investments. And anything else somebody would rather finance than pay cash for. They use the equity in their home to consolidate all of these into one payment. Some may even look to skip refinancing their mortgage and take out a home equity line of credit instead as the closing costs to get one are about $300 compared to the $3k with a 30 year fixed mortgage. Plus, you only pay interest on what you borrow. Get Someone Off Title – Divorces and separations are another reason. There is only one way to get an ex off title of the home and that is to refinance the entire loan into one persons name. Some people find out they cannot get approved on a new mortgage without their ex’s income. This can be quite the dilemma because one person usually wants to keep the house. If there is a lot of equity in the home than the spouse that is no longer living there needs to get paid from whatever equity that has been earned. It can be quite messy and some couples are finding out that they still have to live together until the house can be sold. Clean Up Your Credit – Sometimes people have to refinance their homes to clean up their credit report for a job. Many employers do credit checks on possible candidates. If they see a bunch of collections, judgments, liens, child support payments, foreclosures, and late payments on bills they may not hire you. A quick fix to this is to refinance your mortgage (if you can) and roll all of those into one payment. Your credit report will still show whatever you had on your report for 10 years but at least now all of it will show as being paid and your credit scores should start climbing up. And if the mortgage company cannot refinance your mortgage they will at least be able to tell you whats on the credit report for free. The mortgage banker might even send you over a copy of the report. So instead of you paying $25 for a credit report, they pay to have it pulled. Kind of a sneaky way to get your credit report for free. Legal Issues – It should be noted that if there are collections, liens, judgements, back property taxes, and back income taxes showing up on the credit report that those must be paid before a refinance can close. In most cases those are all held against your property and if you were ever to sell or refinance again those must be taken care of first. Its a combination of guidelines written by the mortgage companies and the law. The mortgage company wants to be in first lien position on your property and those can be seen as first lien if registered before the new loan. Did you know that refinancing a mortgage is relatively new. No one refinanced mortgages from the 1950s to the 1990s. Everybody that bought a home would put a 20%+ down payment on the home. This was a common practice for all banks in that time period because many did not want to have to deal with a home going into foreclosure. Foreclosing on a home was a term hardly used in those years. People who bought homes had so much money invested in their down payment that they did not want to lose their home. They also had enough money saved up and had money to make the payments. And interest rates stayed over 10% during those decades giving little benefit to do so. This is double or triple what today’s mortgage rates are at so people had to be able to afford the payment. Refinancing is here to stay. And whatever your reason is, just make sure it hits all your goals and puts you in a good financial situation.